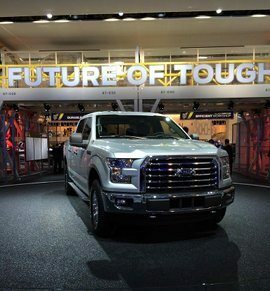 Ford is taking another huge leap toward filling the void created by our lack of a national energy policy with the launch of its new F-150 pickup truck. Ford is stealing the spotlight at the North American International Auto Show by engineering a full-size pickup truck with an aluminum body. This is a bet-the-company move by Ford. The F-150 is both America's and Ford's vehicle sales leader. It has been the U.S. truck sales leader for 37 consecutive years. Losing this bet will rank with the Edsel. Winning it will be comparable to the success of the iconic Mustang. The new F-150 delivers everything America's heartland loves about pickup trucks. This is a full-size truck. It screams tough. Ford's technology innovations underpin this visual impression. Its use of aluminum delivers "military grade" metal toughness. They claim their truck beds are now more dent-resistant than past steel trucks. What an aluminum-alloy body also delivers is lighter weight. Ford claims cutting 700 pounds from last year's F-150 without sacrificing size. Reduced vehicle weight means increased carrying and towing capacity. It also means higher fuel economy. Ford's new Eco-boost 2.7 liter V6 will further push up fuel savings. This engine has the horsepower and torque of a mid-sized V-8. While MPG performance has not been released, the combination of less weight and a more efficient engine should catapult the F-150 into fuel efficiency levels that previously could only be achieved by small pickups. And the new F-150 delivers American jobs. The F-150 will be manufactured in Ford's Dearborn Truck Plant and its Kansas City Assembly Plant. Can the F-150 bring America together? America's pickup trucks are one of our cultural icons that embody the "don't trend on me" American spirit. The top three selling vehicles in the U.S. were pickup trucks last year. It has become the American technology path for making a personal statement, raising a family, and enjoying our love for hunting, fishing and boating. If the U.S. is going to embrace any form of a national energy policy to achieve energy independence and craft climate change solutions, it will require a solution to America's love of full-size pickup trucks. Ford has opened the door to this potential with the F-150. The F-150 delivers on consumers' expectation of wanting it all. They want big trucks. They want fuel economy. They demand strong performance. Ford promotes the F-150 as their toughest, smartest and most capable truck. It also might become a symbol that we can come together on sustainability through technology innovation and vision, as demonstrated by Ford's big bet on the new F-150. Bill Roth is an economist and the founder of Earth 2017 He coaches business owners and leaders on proven best practices in pricing, marketing and operations that make money and create a positive difference. His book, The Secret Green Sauce, profiles business case studies of pioneering best practices that are proven to win customers and grow product revenues. Follow him on Twitter: @earth2017.